with three lines of the shabad. O Har jio,, O my Lord Waheguru, sada, since forever you have rakhda, protected your bhagtaa, beloved ones, your devotees. dhur, From the very beginning, You are the One who has been saving them, O my Waheguru. par-hilaad jan tuDh raakh la-ay har jee-o harnaakhas maar pachaa-i-aa. O Waheguru you are the one who saved parhilaad, jan, your servants. This story goes back to the golden age of Satyug,. Satguru Paadshah, is telling us that this goes back beyond the ages. Waheguru has been looking after his bhagats, since time beyond we know, just as Guru Ram Das Ji says in the Aasaa Raag, on Ang, 451 of Guru Granth Sahib Ji. har jug jug bhagat upaaya paij rakhda aaya raam rajay, Akaal Purakh, create his devotee in each yug, in each time frame and paij, rakhda aaya, and has protected them through out the years whether that is from the very beginning, the aad, or whether it is to this day, through out the whole of time in history. Those who have stuck to the truth have been looked after by Akaal Purakh,. Just as Parhilaad, was raakh la-ay, saved from Harnakash,, his own father, what did Guru Sahib do to him maar pachaa-i-aa, Waheguru Ji completely destroyed Harnakash,. Harnakash, and Parhilaad, an age old story, how Harnakash, became egotistical and tried to get everyone call him god and how his son stood up against him. The story is written many times in Sri Guru Granth Sahib, Paadshah, Jis, vachan, and their words. O Waheguru you are the one who saved Parhilaad, and you are the who destroyed Harnakash,. O Waheguru this is your glory, greatness, your vadi-aa-ee,. O Swami, O Lord, you paij, rakh, protect the honor of your bhagat, your beloved ones. And the bhagats, come into your protection teri sarnaa-ee,. rehaa-o, Guru Ji says pause and think about this. The messengers of death jam, cannot go near johi, na, sakai, the bhagats, the devotees, the beloved of Waheguru. kaal, Death cannot touch them. As Guru Nanak Paadshah, says in Japji Sahib,, na ooh mareh na thagay jaye jinkay raam vasai man mahay, Those people who have Raam,, Waheguru within them they cannot die. Death does not come near them, they are immortal forever kayval, raam naam man vasi-aa naamay hee mukat paa-ee,. Only raam naam man vasi-aa, name of Waheguru is abiding in their minds. And through the naamay hee Naam, of Waheguru they acheive muktee, liberation. riDh siDh sabh bhagtaa charnee laagee gur kai sahj subhaa-ee. All of the miraculous powers and the spiritual powers, attach themselves to the lotus feet of the bhagats, devotees, beloved ones of Waheguru. Through the Gurus grace they achieve utter peace sahj,, complete and utter inner balance. They are not Gurmukhs,, they do not follow the Guru in any way at all and in their hirdai, hearts they do not attach themselves to the Shabad,, to the word of the Guru. har naam na laagaa bhaa-o, And they do not have any bhaa-o, love for the Naam,, name of Waheguru. koorh kapat paaj leh jaasee manmukh feekaa alaa-o. But all the paaj, veils of falsehood, of kapat,, of evil, and deceiving people leh jaasee, will all be removed one day. manmukh feekaa alaa-o, Everything that the ones who follow their minds, the manmukhs, say is feekaa, their words has no essence to them, no glory or beauty to them. Their words are hollow. bhagtaa vich aap varatdaa parabh jee bhagtee hoo too jaataa. Waheguru aap, himself works through his bhagat, his devotees, his beloved ones. Only through devotion, only through worship can anyone know the Lord. All this maya, all this illusion, all this attachment, sabh lok, all these people Waheguru Ji, they are all yours. too ayko purakh bidhaataa, You are the maker of all destinies. what happens My ego is killed, and mansaa all my desires just fall away within my mind. gur kai sabad pachhaataa, I have recognized Waheguru through the words of the Guru. achint kamm karahi parabh tin kay jin har kaa naam pi-aaraa. God without them having to take any worry, achint, with no worry, kamm karahi parabh tin kay, Waheguru does everything for them, He takes on their workload himself, jin har kaa naam pi-aaraa, for those people who have complete love for the name of Waheguru, who are in love with the name of Waheguru. gur parsaad sadaa man vasi-aa sabh kaaj savaaranhaaraa. gur parsaad, Through the Gurus grace, sada, forever, Waheguru comes to abide within their mind. sabh kaaj, savaaranhaaraa, He resolves all of their work, everything for them. onaa kee rees karay so viguchai jin har parabh hai rakhvaaraa. Those people who do their rees, just pretend to be like them, so viguchai, they end up being destroy the fakers because the true saints have Waheguru as their rakhvaaraa, as their protector. Without doing the seva, of the true Guru, Satguru, no one has found God. Manmukhs, literally bhauk, bark like dogs to muay billaa-ee, their deaths. They bark out thier pains. 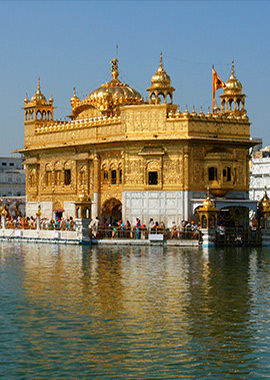 gurmukh hovai so amrit peevai sehjay saach samaa-ee. Without doing the seva, of the true Guru you cannot janam na chhodai, escape being born and dying, jay anayk karam, karai aDhikaa-ee, even if you do many rituals. Those people who read the Vedas,, all they do is vakaaneh, argue about them, bin har pat gavaa-ee, without focusing on Hari they loose all their honor. The true Guru, the Satguru,, whose immortal words are forever saachee, true. bhaj chhooteh gur sarnaa-ee, Run and liberate yourself in the protection of the true Guru. jin har man vasi-aa say dar saachay dar saachai sachi-aaraa. Those people who have Hari, Waheguru abiding within their mind, they are seen as the true ones at the door of the Lord. dar saachai sachi-aaraa and they are called the true ones on the true door, in the true court of Waheguru. naanak tin kai sad balihaarai jin har raakhi-aa ur Dhaaraa.